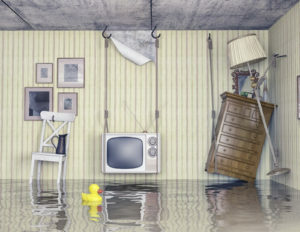 What Steps Should You Take if Your Basement Floods? Dealing with basement floods is never fun and can damage a good bit of your property. Here’s how to handle the situation. There’s a certain feeling of dread and disappointment that comes over you when you get halfway down your basement steps and notice that everything is a bit wetter than it should be. And if your basement floods often, even a light rain can send you checking down the steps every hour or so for damage. Rain isn’t the only cause of basement floods, however. Burst or leaking pipes (inside or out on or above your property), backed up sewers, failed water heaters, and large scale snow or ice melts can also send water your way. If your basement floods, resist the urge to jump in and start snatching up floating items; read these tips first. The first and possibly most important thing to be aware of is the possibility of electrocution when you have basement flooding. Water is an excellent conductor of electricity so it takes very little water to conduct a strong current. Most basements have at least some electrical outlets, but the water doesn’t have to be up to the outlet for there to be a problem. Any electrical devices that are plugged in could conduct current into the water, even if you can’t see them. If you can’t get to the breaker to turn off the electricity without touching the water, call an electrician to come out and safely check the power. Electrical current is not the only potential hazard in the flood water in your basement. Depending on the source, the water could also be contaminated with stuff that you should not get on your skin. This could include sewer water, if the storm drain system backed up anywhere above you, or even possibly sewage. If you have a floor drain or sump pump in your basement, make sure that it is working and not clogged, and use it to empty the water. If you don’t, you’ll need a shop vac or a submergible pump to get the water out. The sooner you can do this, the sooner you will be able to dry out your basement. Mold can begin growing in wet environments in as little as 24 hours. So as soon as you get the water pumped out, you should set up fans and dehumidifiers. Make sure that you point fans at porous materials like drywall and carpets, but be aware that they may still have to eventually be removed. This entry was posted on Friday, February 1st, 2019 at 2:52 pm. Both comments and pings are currently closed.